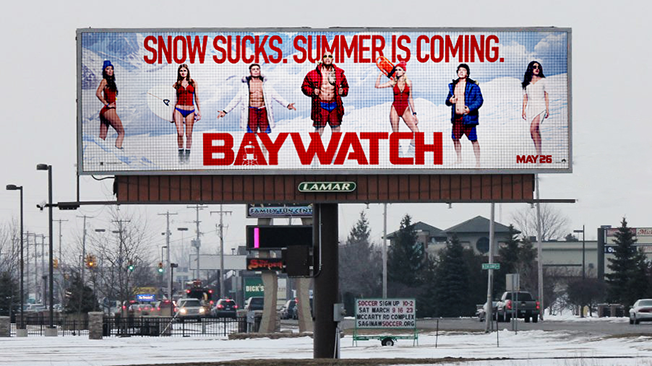 The ad campaign is underway for the Baywatch movie, which opens nationally on May 26. While the forthcoming flick most likely won't go down in cinema history with the likes of Citizen Kane or Chinatown, its Paramount Pictures marketers are approaching out-of-home with a bit of innovation. Utilizing the digital billboard system from Lamar Advertising, Paramount and its team are targeting 16 mostly rust-belt or corn-belt mid-sized markets with ads that change according to the weather happening around the signage. The towns being pitched include the likes of Flint, Mich., Waterloo, Iowa, Lincoln, Neb., Sioux Falls, S.D., Green Bay, Wisc., Syracuse, N.Y., and Casper, Wyo. A total of 52 digital billboards will be employed through Feb. 5 in the endeavor. 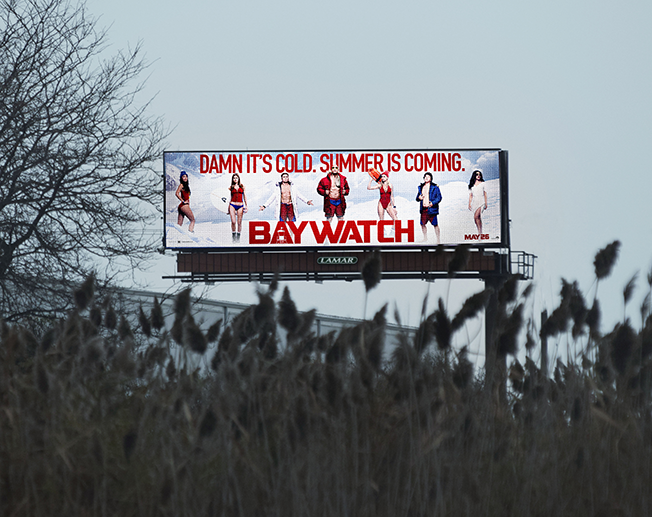 The ads highlight whether passersby are experiencing either brutal cold, snow or rain, with the promise that summer is coming in the name of Baywatch, which stars Alexandra Daddario, Priyanka Chopra, Dwayne Johnson and Zac Efron. What creative appears depends on the local weather data. The movie, of course, is based on the themes of the Baywatch TV program that ran on NBC and in syndication from 1989 through 2001. Weather-data-based advertising has become a bit of a "bright, shiny object" in the world of marketing, and it's often attempted to be done via mobile phones with precise, one-to-one targeting. 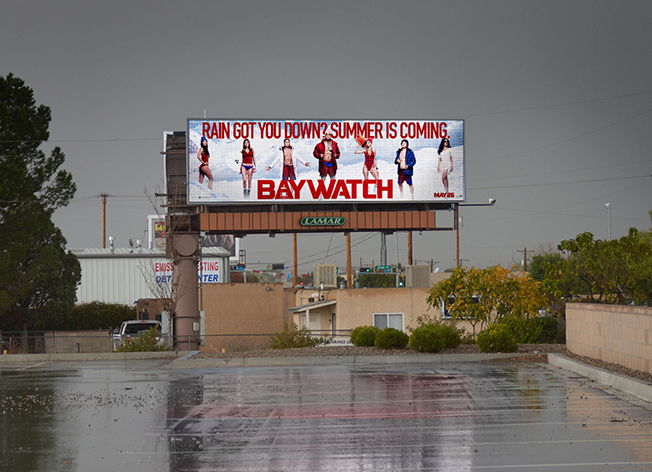 What makes the Baywatch effort different is not only the traditional mass-advertising medium being employed, but also that the endeavor combines real-time climate conditions via automation with the idea of empathy. Can empathy be automated? Whether these digital billboards nudge folks to the box office may help answer that question.